Belize Management Services - "Our Belize Vacation"
People usually buy property on Ambergris Caye Island for one of two reasons: (1) perhaps you are a frequent visitor to Belize and you would like a property to use as a second home for yourself, friends and family; or (2) you have investment interests in property here and plan to place your property in a rental pool program. Whatever your plans are for your dream property here on Ambergris, one thing is for sure........you need a caretaker to make sure that your property is maintained. The rise in television programs extolling the virtues of "buy to rent" properties in destinations such as Belize, has made the dream a reality for many people. The importance of good property management once you have bought property should not be underestimated. Excellent property management is not just about looking after your property; to be honest that's the easy part. Most people who come to Ambergris Caye Island, are here "to rent" . They should be viewed as your customers and you want them to enjoy their stay (so much) that they will not only come back, but they will refer all their friends, family and acquaintances to you. Your property needs to be kept clean, welcoming and well maintained both inside and out. You will also need someone to call upon in cases of emergencies. Marketing and advertising your property here on Ambergris needs much attention. Clear photographs, well-written descriptive text and appropriate rental rates are just the beginning. We can help you to maximize your property exposure, allowing you to increase your rental income. Ambergris Caye is now becoming the capital tourist destination for Belize. There are many resorts, private villas and individual condos, which currently comprise the rental market here on this island. Make sure your property is managed by a competent, professional management company. Property located on Ambergris Caye island, is one of the best investments you can make. If you don't stay here long term, an excellent way to cover the cost of the property is to rent your property out during peak or high season months. There are however some pitfalls which can be avoided by going with professional competent management. 1. Decide on your financial objectives. Do you want to maximize the income or just cover costs? 2. How often do you want to be here in Belize? Do you have certain dates or can you be flexible and go on weeks when there are no bookings? 3. What type of people do you want to stay in your home? Are you child and animal friendly? 4. Have you any idea of expected rental fees? You also need to furnish and equip your property. Cost is obviously an issue, but it is important that your fixtures, fitting and furnishing wear well and you shouldn't compromise on comfort and style to achieve this balance. Once your property is furnished, you should make a checklist. We can then go through this with guests at the start and end of each rental. Black Orchid Management can help you with this. As a responsible owner you need to equip your property with safety in mind. Install smoke alarms, write depth markings around the pool and leave clear instructions for the appliances in the rental property. Make sure you point out the suitability of your rental property for small children or people with disabilities. Black Orchid Management can help you with this. The marketing and advertising of private villas and homes to rent is a time consuming process. Over the last few years there have been many commercial and private property developers here on Ambergris who are developing properties to aim at the buy to rent market. The majority of these properties are very similar in size, style and content and standard. It is important that your rental property has maximum positive exposure and that the guests who are renting your property will encourage other people to rent it too. Black Orchid Management, can help you with this. When people rent a property in an unfamiliar area or a foreign country, they need to know certain information, such as where the nearest shop is, and when the buses run. You will need to leave a guest book and a set of house rules. You may also want to leave maps and pamphlets concerning tours and excursions and places to visit. Black Orchid Management can help you with this. Other important considerations for any owner thinking of renting his property are taxes and insurance. If you are renting your property as a business, you must inform your insurer, as there may be additional insurance requirements or endorsements that you will need to purchase. If you do not state that your property is for rent, any future claims may be null and void. Black Orchid Management can help you with this. Your property will require cleaning after each rental and possibly during them - and no matter how hard wearing your furnishings may be, damage and wear-and-tear are bound to occur. Black Orchid can arrange for cleaning services and carry out maintenance and essential repairs for you. Renting a property is a big responsibility in many ways. This is where we can help you. Let us take all the stress out of the experience for you while you sit back. Our management services include a full rental package from advertising to cleaning. All our subscribers are advertised for free on our web-site. Caye Coffee .com Caye Coffee supplies freshly roasted coffee to San Pedro Town and communities throughout Belize And now within the United States via CayeCoffee.com. Caye Coffee (pronounced "key" coffee) is located on Ambergris Caye, a small island in the Caribbean just off the coast of Belize. 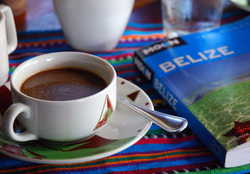 Caye Coffee are the first and only coffee suppliers to set up a roasting facility designed to offer fresh roasted coffee to the people of Belize. Our coffee is roasted on site in our Diedrich roaster and our main focus is supplying businesses, resorts and individuals with freshly roasted and ground coffee by the pound. If you are ever on on Ambergris Caye please visit our coffee shop in San Pedro Town, you can have a cup of coffee and watch the whole process as we turn our green coffee beans into the magic brew you so enjoy! We're right next door to the Sausage Factory, just follow the signs or ask any local, they can tell you how to find us. Take a few minutes now to browse through our web-site to learn a bit more about our coffee.